There are more than 3 million cases of periodontal disease in the United States every year. Dr. Alexander Visot offers treatment and counseling on how to prevent periodontal disease symptoms right from the comfort of his Woodland Hills, California office. Missing teeth, loose teeth, and bleeding gums are just some of the complications stemming from periodontal disease. To learn more about treatment options, call or use the online scheduling tool to set up an appointment with Dr. Visot today. 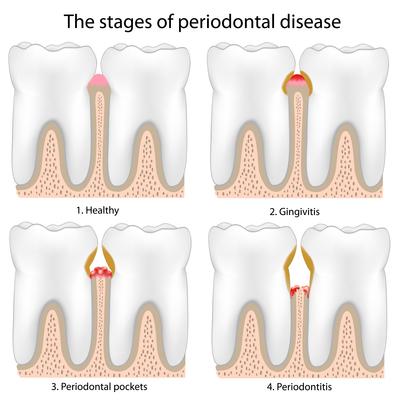 Periodontal disease refers to infections affecting the structures of your teeth. It can impact your gums, roots, bone, and ligaments. Gingivitis, a severe form of gum disease, can at first only affect your gums, but it can spread and affect supporting tissue. Your teeth becoming loose is a clear cut sign of periodontal disease and requires professional dental intervention. Your best bet of staving off periodontal disease is through maintaining proper oral hygiene. Bacteria in dental plaque that forms inside your mouth is usually the leading culprit of this condition. Your body’s reaction to bacterial infection causes the troubling symptoms of periodontal disease like tooth decay, loosening teeth, and bleeding gums. If plaque builds up over time around your teeth, it hardens and turns into tartar, which can cover the roots of your teeth. A layer of tartar can attract more plaque, leading to a domino effect. Brushing with certain toothpastes can help control tartar growth, but it can’t do anything about existing tartar beneath your gumline. That requires intervention from Dr. Visot. Dr. Visot recommends brushing at least twice a day with fluoride toothpaste and flossing every day. You should also maintain a schedule of regular visits with Dr. Visot to make sure your oral health is in good shape. How does Dr. Visot treat periodontal disease? Dr. Visot first meets with you and performs a thorough evaluation to determine the extent of damage to your teeth and gums. He then works with you to develop a personalized treatment plan. He can help treat conditions like swollen or bleeding gums, loose teeth, fractured teeth, and missing teeth by offering a variety of treatments. Some of these include crowns, dental implants, dentures, bridges, and surgical procedures. If you think you might have periodontal disease, call or use the online scheduling tool to arrange an appointment with Dr. Visot today.